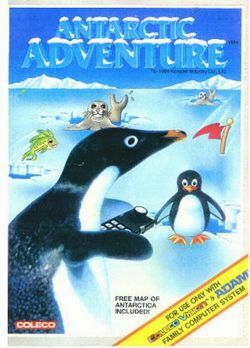 Antarctic Adventure, known in Japan as けっきょく南極大冒険 (Kekkyoku Nankyoku Daibouken, , lit. Antarctic Adventure: Penguin and Seal? ), is an arcade game developed by Konami in 1983, and later published for ColecoVision, MSX, and Famicom. The player takes the role of an Antarctic penguin, racing to disparate research stations owned by different countries in Antarctica. You control a penguin, later named Penta, and you must reach the next station before time runs out while avoiding sea lions and breaks in the ice. Throughout the levels, fish jump out of ice holes and can be caught for bonus points. The game, like many early video games, has no ending – when the player reaches the last station, the game starts from the first level again, but with increased difficulty. Note: Although these controls refer specifically to the NES/Famicom version of the game, they can be generally applied to all other systems. : Press up to increase the speed at which the penguin traverses the ice. : Press down to decrease the penguin's speed. or : Press left or right to navigate laterally across the ice. or : Press either button to make the Penguin jump in the air. If your penguin has collected a flashing flag and has a propeller hat, press either button a second time to briefly hover in the air as you advance. Ponds: Small ponds of water collect on the surface of the ice. They jump be jumped or avoided. If you hit them, your speed will be reduced to 0. Crevice: Wide breaks in the ice that must be jumped or side stepped. Because of their width, it is easier to jump them, but they sometimes occur back to back. Either jump early enough to jump the second one, or jump late enough to clear them both with one jump. If you do not clear the crevice, you will fall in it and grab the edge. You must tap the button to jump out of it and continue. Walrus: Some ponds contain Walruses who rise out of the water whenever they hear penguins approaching. Walrus inhabited ponds cannot be jumped over and must be avoided completely. Fish: Fish occasionally jump out of ponds as you pass by. Collect them for bonus points. Flags: Flags occur intermittently along the ice. Collect them for bonus points. Flashing Flags: A flashing flag is worth 1000 points, and grants the penguin a propeller hat power-up. You must reach each base in the alloted amount of time. You can see how many seconds you have left, and what distance you need to travel. In general, move at the highest speed as much as possible. Only slow down if there is an abundance of obstacles coming at you and you need more time to jump over them. When the course bends, you will begin to slide in towards the outside of the bend. Push in the opposite direction to correct your position. Don't go out of your way to collect fish or flags. Only grab them when it is safe and convenient to do so. If you pick up a flashing flag and earn the propeller hat. Try to save it for a moment when a lot of obstacles are coming at once so you can clear them all in one shot. When you clear 10 stages, you begin the course over again from the beginning at a higher difficulty level. This page was last edited on 11 February 2016, at 01:05.